Higher Education Whisperer: MOOCs the New Millennium Propaganda Tool? Tom Rice describes the use of 1950s mobile cinema as the "British Empire’s forgotten propaganda tool for ‘primitive peoples’" (Rice, 2016). 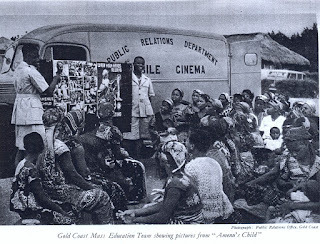 However, at the time film was a way to provide distance education in remote areas, with advice being provided by bodies UNESCO on its use (1949). The film van of the 1950s could be thought of in much the same way as digital multimedia via the Internet is used for education now (Worthington, 2014). Today's MOOCs could be seen as a continuation of a form of soft-power projection, with governments using on-line education to shape views in developing nations and to ope up trade. In the 1940s equipment for Australian militarily mobile cinemas was manufactured by Raycophone in Sydney. This equipment was used in PNG for training (da Cruz, 2015). In the 1950s Australia decided to fund six cinema vans and educational films for Indonesian vocational training, as part of the Colombo Plan (Oakman, p. 85, 2010). Vans were also requested for India (Crocker, 1953). As a digital update to the Colombo Plan, in 2001 the Australian Government announced a five year $230M "Virtual Colombo Plan", to support of Distance Education programs based in developing countries. However, Rooksby (2004) asked if this was, at least in part, intended to open developing countries’ markets to international competition. The "free" massive open on-line courses (MOOCs) could be seen as a continuation of this use of education by some countries to promote their values and open up trade in developing nations.